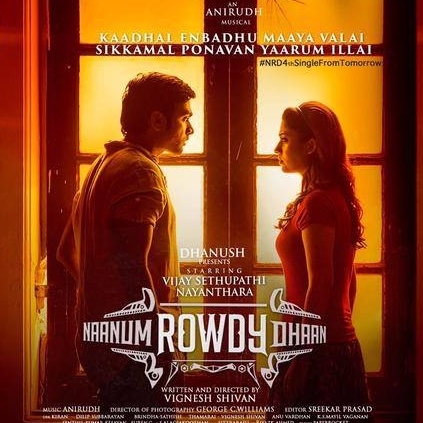 Naanum Rowdy Dhaan (NRD) has been making the right buzz on its musical side by releasing a single song every day in the past few days. The film is directed by Vignesh Shivan and features Vijay Sethupathi and Nayanthara in the lead roles and is produced by Dhanush’s Wunderbar Films. Music is scored by Anirudh. The teaser of NRD was out yesterday, the 9th October and has been creating the right kind of ripples across all quarters. The highlight is definitely the chemistry between Vijay Sethupathi and Nayanthara and the duo looks super cool and chic. Sethupathi has shed his bearded appearance and sports a debonair college going lad avatar. Nayan looks much younger and is glowing. Her costumes are definitely smart and chic. As reported by Vignesh Shivan earlier, Nayan appears to be a hearing impaired girl who is sound in lip reading. Her interaction with Sethupathi wanting to meet a REAL rowdy comes across pretty enjoyable. Motta Rajendran with his idea of parameters to be a rowdy and Sethupathi’s tryst with Anand Raj are all indicative of the fact that Naanum Rowdy Dhaan is going to be an entertainer all along. We are waiting! Ilayathalapathy’s ‘semma’ dance for Vijay 59! Puli is still holding strong! People looking for online information on Naanum Rowdy Dhaan, Nayanthara, Vijay Sethupathi will find this news story useful.